From colorful spring blooms to blazing fall colors, nature’s plants are the true highlight to any outdoor space. Plant materials are the most beneficial component to your landscape. Our hand selected trees, container plants, ground covers and perennials bring texture, scale and color to your yard while providing a relaxing serene and tranquil environment. Plants provide us with shade, help cool our homes, filter dust and increase the value of our property more than many other investments. Fire is a great way to draw people together any time of year. The comforting warmth and dramatic glow are creature comforts that we all enjoy. 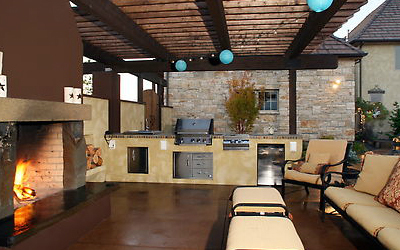 Whether your choice is gas or wood burning, we can create a unique feature that will have your friends and family begging for more s’mores. 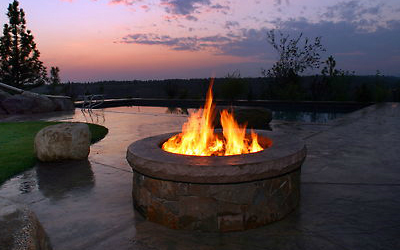 Ask us about adding a fire pit to your backyard. Are you a person who can’t get enough of summer, but don’t have the time to hit the lake every weekend? Why not bring the lake to your home! 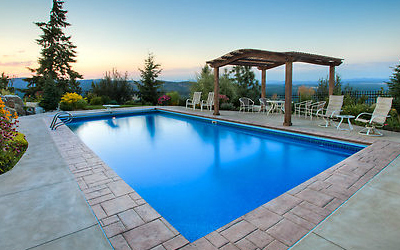 If you are looking for a pool, hot tub, or dipping pond, we have the team in place to suit your every need and more. At Coppercreek we will address all the details to create a cohesive whole, seamlessly integrating the home and landscape into a water filled resort. 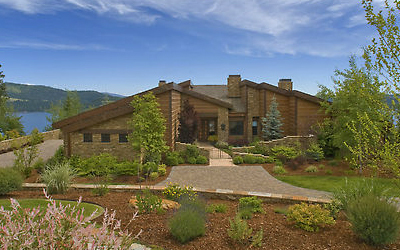 Taking advantage of the fine Northwest air is one of the many benefits to living in this remarkable area. To many, the most comfortable getaway is at home. Imagine bringing your indoor luxuries outdoors and being able to share the experience with those closest to you. Whether a fireside getaway, or an outdoor kitchen under the shelter of a custom pergola, no job is too large for Coppercreek to handle. Let us transform your space to come alive outside. 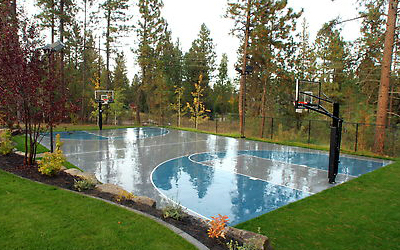 Do you and your family’s lives revolve around sports? We get it. Offering you the ability to tell us what YOU are looking for, we can design sportscourts unique to your site and to the sport you enjoy to play. We can’t guarantee your kids will be the next top athlete, but we can promise that you will be the neighborhood hangout for years to come! One of nature’s greatest gifts is the distinct sound of water. These sounds, matched with unforgettable scenery, generate the soothing atmosphere we aspire to hear. 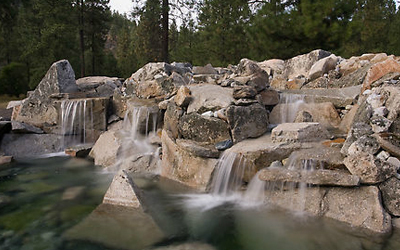 Water features allow homeowners a way to bring natural elements into their home. Let us turn your home into a retreat. Just sit back, listen and enjoy. 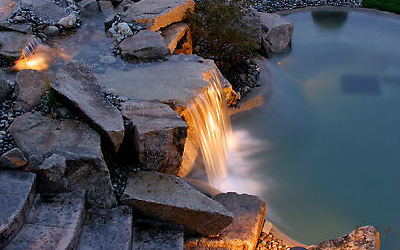 For those looking to enhance their landscape when the sun goes down, nightscaping options are for you. Offering a variety of applications, our team can develop a lighting scheme to match your budget and taste, specific to your project. Illuminate your garden paths, trees, structures and pool with our amazing selection of lighting fixtures. And you thought your space looked good during the day…just wait! 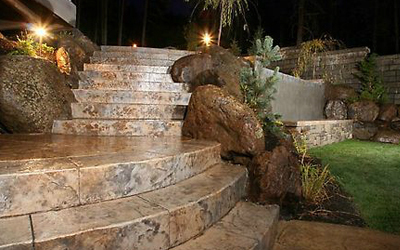 If you are looking to separate your yard in an absolutely unique fashion, then custom stone work may be the answer for you. Our team and equipment is ready to tackle anything your terrain throws our way. 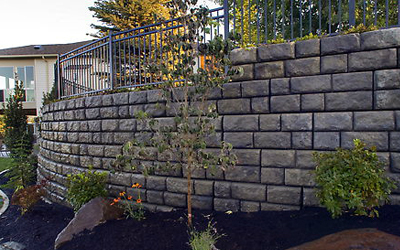 From engineered wall systems and natural outcroppings, to stunning veneer finishes, the details are no problem here at Coppercreek Landscaping! Think you have a crazy idea for the design of your landscape? Think again! Coppercreek not only specializes in custom design, we encourage our clients to push our creative limits. Let us transform every detail of your landscape, no matter how bizarre, into a reality. Need your commercial or residential properties plowed in the winter? Coppercreek Landscaping can handle it! 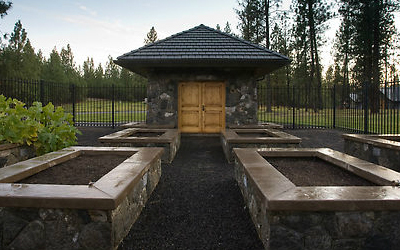 We have been helping our clients in the Spokane and Coeur d’Alene areas for many years. Here at Coppercreek we also offer sanding and deicing services. Coppercreek Landscaping can handle all of your decking and covered patio needs! No job is too large for Coppercreek to handle. Let us transform your space to come alive outside.